Fault, Not Solidarity: a Normative Argument to Save the Eurozone? 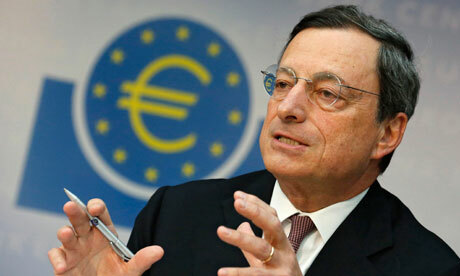 The pace of the Eurozone crisis often defies even the most conscientious observers. Mario Draghi’s comments last week that the ECB would do ‘whatever it takes’ within its mandate raised the prospect of ECB intervention in the secondary sovereign-debt market. A follow-up joint declaration from Merkel-Hollande (that ‘they are committed to do everything to protect the eurozone’) was also bold, echoed by a similar declaration from Merkel-Monti. But then there were news reports over the weekend suggesting that ‘everything’ apparently does not include purchases of Spanish debt by the Eurozone’s current bailout fund (the EFSF) or any additional concessions to Greece. Behind the distractions of day-to-day events, however, certain fundamentals in the crisis persist. With Spain seemingly unraveling, the adequacy of the existing crisis mechanisms remains as questionable as ever. Commentators continue to argue that the functional demands of the crisis will eventually force Germany and other surplus countries to accept something like Eurobonds (debt-mutualization), if not in name then at least in substance. In this regard, the publication last week of a report by group of 17 leading European economists, organized by the Institute for New Economic Thinking (INET), a Soros-backed outfit, has garnered a good deal of media attention, not merely for its dire warnings of impending disaster, but also its effort to outline a comprehensive solution to the crisis. Entitled ‘Breaking the Deadlock: A Path Out of the Crisis’, the report is well worth the read, certainly by policy makers, but also by lawyers. The report focuses on policy proposals, to be sure. But it also attempts to outline a specifically normative argument, one that might justify burden-sharing among the Eurozone member states, such as short-term debt-mutualization of the type encompassed in the so-called ‘European Debt Redemption Pact’. This is refreshing. Too often economists ignore how institutional change is not merely a consequence of functional demand but also a complex interplay with political-cultural factors. The normative argument outlined in the INET report is helpful because it (at least implicitly) recognizes the importance of that political-cultural dynamic. It is just because the problems that the deficit countries are struggling with were not caused by these countries in isolation, but were the result of a flawed euro zone design that encouraged both reckless borrowing (in the deficit countries) and reckless lending (in the surplus countries). Hence, all countries that signed up to this design, and took part in the lending and borrowing boom, bear responsibility for the crisis. This argument should be developed further, specifically in legal terms, because it might help the Eurozone survive against the sort of ‘democracy’-based constitutional attack that is likely to be mounted in creditor countries like Germany. To rephrase the argument along those lines: The Eurozone crisis has resulted from the democratic decision of each Eurozone state to establish/join/perpetuate the flawed EMU, and thus each state must bear responsibility for the damage caused as the system has inevitably lurched into crisis. This responsibility may take the form of suffering through austerity and fiscal discipline (say, Ireland or Portugal), or of making the necessary transfers in the immediate term to fix the problem (say, Germany). But the fact that a country (say, Spain) fulfilled the requirements of the original agreement is beside the point; what matters is that all countries share responsibility for the flawed agreement itself and the damage it has caused. Even if this is not an argument that may convince the readers of Bild or Chancellor Merkel’s Bavarian coalition partners, it may well convince the judges of the German Federal Constitutional Court (GFCC), precisely because it can be recast in terms deeply familiar to the legal mind: fault, causation, responsibility, and proportionality. If Germany does eventually capitulate to the need for burden-sharing at a level commensurate with the crisis (e.g., a redemption pact), the positive opinion of the GFCC will then become crucial, because a constitutional challenge to the program will be inevitable. And to survive constitutional review in Germany or elsewhere, a plausible, democracy-based normative theory will be needed; hence the importance of a modified version of the normative theory based in the INET report. Despite some of the critiques leveled in the direction of the GFCC, the judges on the Court are almost certainly as aware as anyone of the stakes in the current crisis. They are thus almost certainly as anxious as anyone to find a normative principle adequate to support a workable solution. The problem, to date, has been that no one has articulated an adequate justification for burden-sharing beyond open-ended solidarity and the purported teleology of integration culminating in a federal union. The problem with such arguments is that they quickly run up against the intractable ‘no demos’ problem in European integration, along with the national-democracy protective jurisprudence of several high courts, not just the German (for an overview, see Chapter Four of Power and Legitimacy). The challenge, therefore, is to avoid idealist appeals to intra-European solidarity (no matter how attractive they be in certain quarters) and instead ground the normative principle in the idea of democratic and constitutional responsibility of each participating state. The fault principle may have some real potential in that regard. It suggests to me at least that it would not be a violation of the Demokratieprinzip to hold the German people accountable for the consequences of the democratic choice they and their elected representatives made in favor of adhering to what has proven to be a deeply flawed EMU, with all its perverse incentives, resulting imbalances, and illusory and contradictory ‘protections’ (e.g., the ‘no bailout’ clause). Moreover, it would be unacceptable, on the basis of protecting democracy on the national level, to walk away from those consequences now (particular given that the Court itself had previously approved adherence to the EMU as constitutional). Burden-sharing thus may be justified both in terms of the Demokratieprinzip as well as Germany’s constitutional‘openness to European law’ (Europarechtsfreundlichkeit). [I]t is important to note what is not in the proposal: a permanent mechanism for common euro zone debt issuance and a mechanism for countercyclical fiscal transfers. Indeed, there is no common liability in any of our long-term proposals beyond those necessary to establish and backstop the banking union and the ESM, and both are subject to strict safeguards. [T]he critical requirement for tackling the crisis is to separate the solution of the “legacy problem” – stopping the on-going recessions, reducing debt levels, and lowering current account surpluses and deficits within the currency union – from the problem of fixing the structural flaws of the euro zone for the long term. The former requires significant burden sharing. But it does not follow that the latter requires permanent transfers or jointly and severally issued debt. The burden-sharing to address the ‘legacy problem’, although quite substantial, is presumably calculable and hence adequately determinate; a commitment to open-ended transfers in the future, by contrast, is not. The latter, as I have tried to point out previously on this blog, almost certainly falls on the wrong side of the constitutional ‘fault-line’ defined by the GFCC. But that does not mean that all members of the Eurozone cannot share the burden for the ‘legacy problem’ – either in the form of fiscal discipline/austerity or defined (if substantial) fiscal transfers – because all are, in a very real sense, legally at ‘fault’ by virtue of their participation in the flawed EMU itself and the perverse incentives/imbalances/contradictions it has enabled. But the same degree of burden-sharing, at least in a financial sense, does not necessarily apply to ‘fixing the structural flaws of the euro zone for the long term’, at least to the extent that such fixes would entail open-ended liabilities and thus unconstitutionally impinge on the ongoing viability of democracy on the national level. In this regard, the majority of the authors of the report quite rightly reject ‘a move toward a federal political union as a necessary development of the euro area’ (para.13). As the report elaborates (para.6): ‘Except in the context of a European super-state in which financing and control of spending are tightly linked, a majority of the population in the surplus countries believes that a permanent “transfer union” is too high a price to pay for the preservation of the single currency, even if the alternative is a catastrophic crisis’. The report could have strengthened this argument, however, by acknowledging that the problem identified here is not just political but also constitutional. As the GFCC put it in the Greek Bailout Decision (para.125), the Bundestag ‘is not permitted, even by statute, to subject itself to any mechanism of financial effect, which—whether on the basis of its overall conception or an overall assessment of its individual measures—could lead to unclear burdens of budgetary significance, be they expenditures or revenue losses, without prior constitutive consent’. A one-time, open-ended decision by the Bundestag would not satisfy this requirement; each budgetary burden would need to be individually voted. In short, from the GFCC’s perspective, a ‘transfer union’ – or, in more benign terms, a ‘federal union’ – would entail unacceptable costs to constitutional democracy on the national level. There may well be aspects of the report’s proposals that are in tension with elements of the Court’s prior case (for example, the call, in para.13, for democratic supervision of any new mechanisms of mutual fiscal discipline by way the European Parliament). As I’ve argued on this blog, this raises the question of the ‘dual legitimation’ of European governance that the German Court will inevitably need to clarify. But this problem lies more in the procedural dimension of the Demokratieprinzip, which is more lenient than the substantive dimension. The latter defines absolute limits to supranational delegation whereas the former defines the nature and scope of democratic supervision within the confines of supranational delegation that is otherwise acceptable. One of the great virtues of the fault principle articulated in the INET report may be that it avoids the strictures of the substantive dimension of the Demokratieprinzip and thus shifts the question to the relative balance of Bundestag and EP oversight of delegated supranational authority, a much more manageable terrain. Again, the authors of the INET report could have greatly strengthened their argument if they confronted some of these constitutional questions directly. If INET stands for ‘new economic thinking’, then perhaps any follow up to the report should try, in a genuinely novel way, to develop the normative/constitutional dimension of these proposed policy solutions in more explicit terms. Certainly the present report may contain the kernel of a potentially winning normative argument, or at least one that the judges in Karlsruhe will not find so easy to dismiss out of hand. But to prevail, the fault principle must be further developed, and for that the INET should look not merely to economists for solutions, but also constitutional lawyers. This entry was posted in Uncategorized and tagged Peter Lindseth by eutopialaw. Bookmark the permalink. Professor Lindseth develops a ingeneously very clever argument to justify the one-sided imposition of possibly unlimited burdens on the German taxpayer. I doubt whether any one would have the audacity to suggest such a policy to any other country, probably no even Japan, even if it held out any prospect of solving the crisis. This, however, is far from clear. Rather, given the effect of further burden-sharing and the disincentive it will create for further savings in S. Europe, it is likely that Germany’s credit rating will gradually sink with that of the other countries. It is possible, if not likely, that the euro crisis will return with a vengeance in nine to eighteen months if the German govn. agrees to burden-sharing. The author further suggests that a fatal mistake by the future eurozone governments in the 1990s provides a normative basis for government to lock their populations into the euro rescue now as well as moves towards political and fiscal union. Ther is no legal basis for this argument, nor is there any obvious persuasive argument for the view that an original mistake imposes a specific obligation to move towards debt guarantess and burden sharing. It could as easily be argued that an experiment that failed, should not be repeated! In this context it is relevant that it is not at all clear that Germany benefited from the euro. That argument still has to be made. The fact that everyone simply asserts Germany was the main winner, does not make it true. Put diffferently, Professor Lindset – following Soros et al – appears to argue that the German people have a duty to mutualise all debt in the eurozone or, at least, to accept farreaching burden-sharing, because they voted for EMU in the 1990s. This is simply not true. There was no referendum in Germany, and the electorate had no choice to vote to retain the DeutschMark. All parties were in favour of EMU. If Professor Lindset wanted to establish a case for trying the instigators of EMU, I wd be sympathic. However, to hold the German taxpayer responsible for sth he was given no realistic option to avoid, seems cynical to me. Finally, the Constitutional Court has been quite clear in its Lisbon judgment and the subsequent Greek aid judgment of September 2011. The Bundestag cannot agree to deprive itself of its own budgetary autonomy. According to the FAZ (30 July 2012) Germany’s total exposure as part of the eurozone rescue packages now stands at at least Euros 771bn, which is more than twice the size of the Federal budget. Other estimates vary between Euros 660bn and well over Euros 800bn. If the ESM is ratified and leveraged and if the ECB has to write off some of it government bond holdings and/or buys further bonds, Germany’s exposure will undoubtedly rise further. Furthermore, if the eurozone were to fall apart or if only a few countries were to leave, the Bundesbank would face losses of TARGET2 claims of currently up to arouns Euros 800bn. Germany’s exposure could quickly reach three or four times the size of her federal budget, and thus well over 150% of its current total debt of between Euros 2.1 to 2.4trillion euros. That could be equivalent to around more than 120% of GDP – i.e. Italy’s debt ratio. The Constitutional has not stated that the Bundestag’s budgetary autonomy may be given up if the Germany government under Kohl made a fatal mistake in entering into EMU. If anything, the logic of its position implies that the freedom to make such mistakes ends precisely where it would threaten the budgetary autonormy of the German Parliament. Finally, I do agree with Professor LIndseth that the Constitutional Court will in the end give way to the German government and not stop the ESM, but it will do so despite its reasoning so far and out of political considerations. Its approval of the ESM will be a sad day for democracy and the rule of law – it will be an example that in matter involving the fundamental interests of the executive, courts take political decisions. Why is everyone at pains to justify obvious transgressions of the law – by the ECB, by the Member States, by the European Commissio, and probably by the German Constitutional Court. The answer is that in crucial matters of state – and that should read international finance – there is no longer any freedom of speech. Thank you for your reply. I might have overrepresented the extent of our disagreement. Although I disagree with the argument you develop on the basis of George Soros’, I think it an excellent illustration of the very cleverly integrated type of reasoning the German Federal Constitutional Court is likely to (have to) engage in. Your argument also beautifully and ingeniously illustrates the extent to which courts at all levels, but especially at the highest level, often tend to exploit the blurred distinction between legal and general practical arguments as well as the open-ended nature of legal arguments. There is no doubt that there are many equally valid or invalid arguments which could be constructed in support of one conclusion or another and indeed radically incompatible conclusions, and it is difficult to evaluate their normative merits for the simple reason that legal, or legally acceptable, arguments do not come with a fixed or defined weight or ranking. In consequence, the Court will take a decision for or against the constitutionality of the ESM, and then provide a legal justification for it. Such a justification is likely to exhibit aspects of the format and structural features of the solution you appear to advocate and which I find entirely convincing as a possible assemblage of legal topoi designed to give acceptable expression to a propositional axiom. I think this was very helpful, and I am sorry if I did not make this sufficiently clear. Perhaps it is possible to conclude that legal argumentation on the legality of the euro rescue is open-ended, indeterminate and capable of sustaining a multiplicity of incompatible or alternative solutions as indeed would be the case with almost any serious constitutional issues. 1. Leaving aside the question of whether representative democracy seems increasingly unable to secure outcomes that command majority support, I do not of course deny that representative institutions can have important pragmatic or potentially normative significance. However, it is at least equally obvious that the democratic legitimacy which decisions taken by representative institutions take broadly varies in accordance with the degree of express popular endorsement. Where a decision is taken by a national parliaments after parliamentary debate and a vote involving opposing views advocated by different political parties which had articulated their different policies in a preceding election campaign, has a relatively high degree of democratic legitimacy. That legitimacy is increased further if a referendum is held. By contrast, where a national government and parliament adopt a decision without a referendum and in circumstances where all parliamentary parties support the government despite divided or sceptical public opinion, and the voters are not given a choice to vote for a party opposed to government policy in a national election, has a much lower degree of democratic legitimacy. It does so for the simple reason that the people had no choice in the matter. That was the case with EMU in Germany during the 1990s, and to a lesser extent with the war in Iraq in Britain where PM Blair relied on cross-party support against popular opinion. However, in the latter case MPs effectively commanded a free vote. 3. And finally, the democratic legitimacy of a decision is diminished further in proportion to the difference between the ordinary meaning of the treaty a government signs (i.e. the Maastricht Treaty and the Stability and Growth Pact in Germany’s case) and the meaning subsequently given to those words by either its own government or others. The argument that the German government and people should regard themselves as bound to bail out other countries, might have a certain validity if the Treaties were interpreted broadly in accordance with their ordinary meaning, although, as said, that obligation is weaker in the circumstances outlined above. By contrast, where seemingly unequivocal treaty articles ruling out state financing through the printing press, or national or EU bail-outs for distressed Member States, are patently ignored or distorted, I cannot see how a duty can be imposed in circumstances where German voters have not only not been given a choice, and where public debate is discouraged by political correctness and financial interests, but also in circumstances where treaties no longer mean what they say. There no way in which a party to a contract can foresee the nature and extents of it obligations. Such a contract is commonly void. 1. The fact that all parties supported the decision in favor of the EMU “despite divided or sceptical public opinion” does not undermine its specifically democratic legitimacy in my view. The circumstances surrounding the decision simply show that the process of “political will formation” via parties and representative institutions (including, I would add, the BVerfG) worked as it should in a modern democracy: it yielded a publicly deliberated policy choice. This choice wasn’t, in the end, the most intelligent one, as subsequent events have proven, but it was nonetheless a “democratically legitimate” one in a historically and political-culturally recognizable sense. To allow Germany, or any of the other surplus countries, to escape the consequences of that choice, on purportedly “democracy-protective” grounds, seems to me deeply problematic. It actually risks perverting democracy by failing to take full cognizance of the democratically legitimate character of the initial decision and refusing to assign responsibility accordingly. 2. The German political culture you describe – one that “deters dissent on certain issues” (notably debt-mutualization) – is not one that I would recognize, but then my exposure to Germany is much more limited. During my recent stint as Daimler Fellow at the American Academy in Berlin, I found the German debate on the Eurozone crisis quite vigorous, even if it was tipped in favor of the government. But to provide a counter-example to your anecdote, while in Berlin I was asked to write an opinion piece for a German daily on the Eurozone crisis. When I produced a piece that was too nuanced and insufficiently “American” according to the editors’ presuppositions, they rejected it (it eventually became a post on this blog). Journalists, it seems, deal in stereotypes, so I wouldn’t put too much stock their decision to opt for a different interviewee in your case. 3. Your final point raises perhaps the most fundamental legal-conceptual disagreement between the two of us. You approach the question from the standpoint of contract, whereas I would approach it from that of tort. Whereas you stress the affirmative duties and prohibitions negotiated between the parties, I would stress the duties arising from the very act of entering into the poorly-conceived EMU in the first place. In entering into the treaties, Germany told itself that the ban on monetary financing or strictures against fiscal indiscipline, if complied with, would make the EMU work. But this ignored a myriad of other risks associated with EMU, inter alia the differences in competitiveness, unit labor costs, and the resulting balance of payments problems, which proved to be much greater threats to the stability of the project. Germany took no precautions against those risks (which frankly might have led a “reasonable government” not to enter the EMU in the first place). In that respect, Germany and all the other EMU participating states acted “negligently” by breaching the fundamental duty of reasonable precaution in the structuring of the monetary union as a whole. You stress the breach of the contractual duties that have not, by and large (with the exception perhaps of Greece and maybe Italy), been the cause of the crisis in the system. And yet, the existence of these contractual provisions does aggravate the crisis, because they provide a basis for not dealing with the true systemic problems going forward. From a “tort” perspective, then, these provisions may simply aggravate the negligence of all the participating states for the “democratic” choice made in favor of the EMU. Coming to your final point, I share your concern about over-stretching Germany. No single participating state can handle the burden of resolving the crisis alone. This is why the authors of the INET report argue that some form of burden-sharing is functionally necessary. The key thing to remember, however, is that burden-sharing cannot be considered in isolation but rather only in relation to the alternatives, which for Germany will certainly be even worse. In short, there are no good options for Germany or any other EMU state for that matter. But insisting on the “ordinary meaning” of misdirected and illusory protections in the treaties may simply be a formula for letting the crisis spin completely out of control. As Martin Wolf concluded in a piece in the FT a couple of weeks ago (http://blogs.ft.com/martin-wolf-exchange/2012/06/07/the-german-response/#axzz22EZaM7w6): “Fiat justitia, et pereat mundus (let justice be done, even if the world perishes) is a dangerous motto.” To take that approach, it seems to me, would truly be negligent. The only option then, is to develop an integrated crisis response that actually meets the demands of the situation while also striking the reasonable balance between shared democratic responsibility for the “legacy problem” in the EMU and preserving democracy within participating states for the longer term. I think the INET report makes a plausible case for how to strike that balance, and that’s why I support it.